*CURRENTLY LEASED* 2 bedrooms, 1 bathroom home with privacy. Located just outside of town. Hardwood floors, A.C., electric heat, and laundry room with hookups. ? ? Terms: 1 year lease, credit check, income verification, and landlord verification required. Must fill out application for each adult applicant. $25.00 application fee per applicant when credit is checked. $600 security deposit (cashiers check or money order) and first month's rent or prorate due upon move in. *CURRENTLY LEASED* 2 bedrooms ,1 bathroom home with privacy. Located just outside of town. Hardwood floors, A.C., electric heat, laundry room with hookups. ? ? 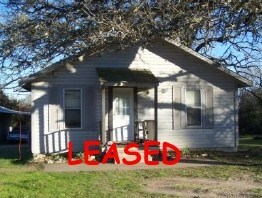 Terms: 1 year lease, credit check, income verification, and landlord verification required. Must fill out application for each adult applicant. $25.00 application fee per applicant when credit is checked. $600 security deposit (cashiers check or money order) and first month's rent or prorate due upon move in.